In the years after 2009, the once-warm relations between Turkey and Israel have deteriorated sharply. To complicate matters further, both countries are close partners of the United States. In April 2011, veteran Middle East analyst and policymaker William B. Quandt brought leading scholar-practitioners from Israel, Turkey, and the United States to a one-day gathering at the University of Virginia. Their task was to unpack and try to understand the tangle of accusations, sensitivities, fears, and misunderstandings that had arisen among policymakers in these three capitals. Troubled Triangle is a record of their deliberations. William B. Quandt is an emeritus professor of politics at the University of Virginia. He served on the National Security Council staff in the 1970s and was a key policy advisor to President Carter's team during the negotiations for the 1978 Camp David Accords negotiations and the subsequent Egyptian-Israeli Peace Treaty. 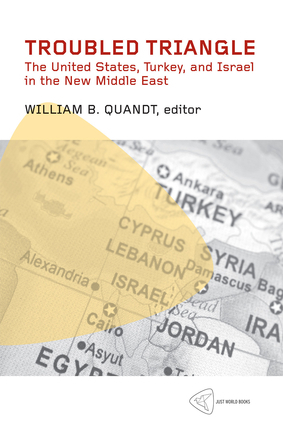 Quandt was a senior foreign policy fellow at the Brookings Institution for many years and has authored numerous books, papers, and articles on the Middle East.